Are you running late for your important funding meeting? You don't want to find yourself all sweaty and in need of a shower as you stand in front of your Board of Directors. Instead, utilize the Pedego City Commuter. 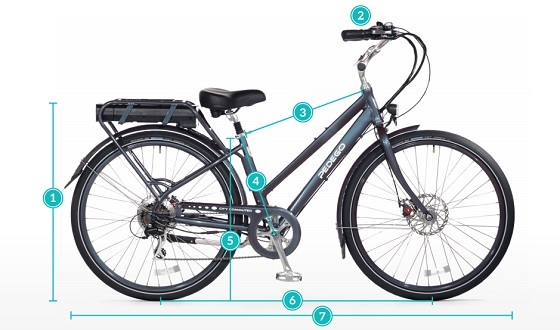 This electric bicycle brings to the table fenders with mud flaps and a fully covered chain guard to keep you looking professional and clean. If you're running late, use one of the higher levels of pedal assist to get to your destination faster. In for a longer commute? The deluxe saddles and the suspension seat post offer additional comfort and the balloon tires give you a smooth ride. The Pedego City commuter is perfect for anyone looking to cut emissions and traffic time while still being able to get to work looking as you intended. Experience a smoother ride with the Kevlar-belted balloon tires, and feel the top notch performance of the state-of-the-art motor as you glide through traffic. No matter the time of day, the front and rear lights will let drivers and other bikers know you're around, and Shimano seven-speed will allow you to keep up with them as well. What battery is best for me? The City Commuter has the option between a 48V 10Ah and a 48v 15Ah battery. The 48V 10Ah is powerful, and perfect for riders over 200 pounds, or if you bike in an area with lots of hills or strong headwinds. The 15Ah option is the best of both worlds, and is the most popular option. It has all of the power of the 48V 10Ah battery and the extended range of the 36V 15Ah. 33 in. 26 in. 22 in. 17 in. 29 in. 44.5 in. 74 in. 28" Step-Thru City Commuter 5'6" - 5'10"
*For shorter riders, a suspension seatpost can sometimes be replaced by a standard seatpost for an extra few inches. Likewise, a longer seatpost can often be used to accommodate taller riders.